We were delighted to achieve Active Futures Approval in November 2018. We believe that children should become respectful and caring citizens. We believe that children should become high achieving learners. We believe that children should becomes high achieving learners. We believe that children should become caring and respectful citizens. At Ormiston Herman Academy we believe in creating a safe, happy and healthy environment where children can feel positive about themselves and the academy. Everyone is encouraged to value and respect one another and the environment. 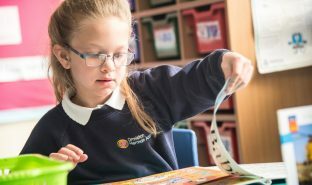 Through our broad, balanced and creative curriculum we ensure high standards of teaching and learning that enable all pupils to reach their full potential. We are committed to providing teaching and learning experiences that are enjoyable, challenging and relevant to the needs of each individual. Ormiston Herman Academy actively promotes the British Values of democracy, the rule of law, individual liberty, mutual respect and tolerance of those of different faiths and beliefs through both the academic and pastoral curricula. Pupils have opportunities to learn independently and to develop their own creative ideas. Effective and meaningful assessment processes are an integral part of our work, enabling teachers, parents and pupils to identify progress and achievement and to diagnose the next steps needed to enhance future development. We recognise and celebrate all successes both inside and outside of the academy. In January 2017 we were inspected by Ofsted. We were awarded a ‘Good’ rating with our Early Years department being rated as ‘Outstanding’. April 5, 2019: Pioneering the way! April 5, 2019: Read-a-thon Champions. April 5, 2019: Year 1; Going on a Bear Hunt. Click on the image to download a PDF of our current academy prospectus.